It’s already been one year since the new tax law known as the Tax Cuts and Jobs Act went into effect. Here it a quick review of the important changes that impact the overall tax liability. 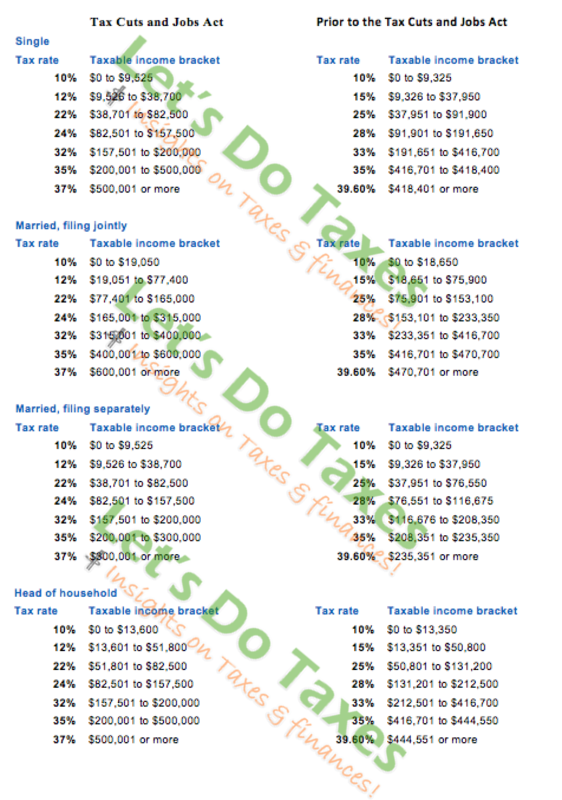 Tax Brackets – The Federal brackets are changing. There has been a change to the tax brackets as well as thresholds for different filing categories. Scroll to the end for details. Standard deduction – In a nutshell, this amount has almost doubled. It has made taking a standard deduction more appealing as there may arguably by fewer cases where itemizing will yield better results. Single filer from $6,500 to $12,000. Head of household from $9,550 to $18,000. Joint filers from $13,000 to $24,000. State and Local Income Tax (SALT) deductions – This is one of the biggest changes the tax law introduced. It caps those deductions at $10,000 (with no limits prior to that) and it’s expected to impact millions of taxpayers. If for example, you made $175,000 and live in a state with 8% income tax, that would be $14,000 in state taxes that were previously deductible entirely. Right now, that person would lose out on $4,000 of that income not being deductible. This $10,000 limit also includes property taxes. Property taxes vary from state to state and from county to county ranging anywhere from 0.3% to 2.5% In many cases the states with low personal income tax rates have high property tax rates and vice versa. It will become harder for many people to come under $10,000 threshold and deduct all that was paid in taxes. Previously you could deduct interest on mortgage of up to $1 million. Currently this deduction in capped on mortgages up to $750,000. Overall, this change may not affect majority of taxpayers because the number of homes with those values constitute a small percentage of total. Child tax credit – Increasing from $1,000 to $2,000 per child. Of that, $1,400 will be refundable (up from $1,100) after you file your taxes. Additionally, there is a new credit of $500 for non-children dependents and childcare credits up to $1,050 for one child and up to $2,100 for more than two children. American Opportunity Credit – Up to $2,500. Lifetime Learning Credit – Up to $2,000. Student loan interest deduction – Up to $2,500. Obamacare individual mandate penalty is going away. Up until last year you had to have a health insurance unless you were exempt. Average penalty for not having a health insurance was $400 in 2018. Alternative Minimum Tax (AMT) is retained, but there are higher exemptions to counter that tax. Charitable deductions – Previously up to 50% of Adjusted Gross Income (AGI) could go to charities. That has increased to 60% of AGI.